The Spirit of God uses the Word of God to do the Work of God in the People of God. 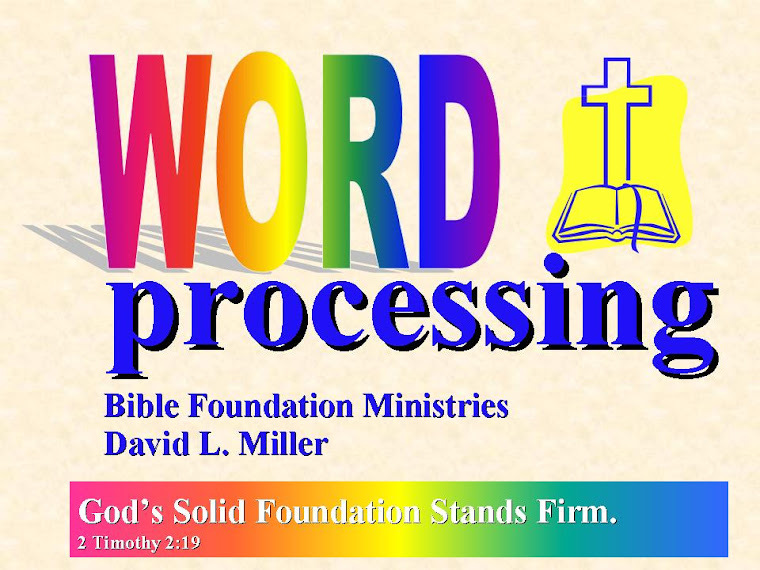 So, we will examine God's Word to "process" it in our lives. I was doing some work on this blog and it appears I may have published a whole bunch of old blogs. I hope I didn't - I'm not real savvy with this thing. But, if I did, you have my apologies for filling the inbox of anyone who follows this. Fortunately, its not that many folks. Significant Servants, October 25, 2009 "Christian Insanity"
Ever heard this one? “The definition of insanity is doing the same thing over and over again and expecting a different result.” The quote has been attributed to both Benjamin Franklin and Albert Einstein, but may have actually been coined by a Minnesota Vikings football coach in 1991. Whatever the source, the quote has proliferated wildly in corporate culture and has found its way into the church growth movement. If we want to reverse the current stagnation of Christianity and the decline of so many churches, we must embrace new ways, new methods and new strategies. We cannot keep doing the same things that we have been doing all these years and expect them to magically start working now. And, of course, there is some truth to that. I have known pastors and church leaders who are hopelessly stuck in the 1950’s church mindset and will not leave that behind. They think that a true church has to look like the church I grew up in. We need to sing the songs we sang back then (in the same style we sang them – no drums or guitars, please). They think we need to wear ties and coats like we did then and structure Sunday School the old-school way. If “revivals” worked then, surely they will work today. Church growth? Get out and knock on doors like we did when I was young. But there is also danger in the pragmatic mindset that has come to dominate our thinking. There are times in which we must continue doing what is right even if the lost world does not like it. What pragmatists often fail to understand is that the world hates the truth (as Jesus promised) and rejects it. We can modernize our methods and try to make our churches less imposing to visitors, but we cannot make our message more palatable without compromising the hard truth of the gospel. When we become pragmatists, when we judge our methods by the bottom line of church growth, we run the risk of compromising our gospel integrity. A time is coming, Paul said, in which the sound teachings of God’s Word will not be well-received by people, even, it is implied, people in the visible church. Instead of listening to the hard teachings of Scripture and adjusting their lives to God’s will, these people will seek out teachers and preachers who will tell them exactly what they want to hear, who will affirm their passions and desires instead of confronting them. These people will turn away from God’s hard truths and will embrace spiritual myths. It is clear to me that this is happening today. And that is a problem for pragmatists. If people do not want to hear the truth, do we continue preaching it? If people are prone to reject the truth, will preaching the unvarnished truth make a church grow? If the church does not grow from preaching the truth should we adjust the message? Should we soft-peddle sin and shield people from the realities of God’s judgment and death and hell? I find it both interesting and amazing how often human ideas conflict with God’s will and ways. It is a given in this world that we should not continue to do the same thing over and over again if it is not working. Yet, in the Bible, it is often by continuing to do the same thing over and over again, even when it is not working, that great victories come. Is it possible that continuing in God’s ways even when they are not working is not insanity, but a key to spiritual victory? A few years back, we decided to put a shower in our basement bathroom. I got a sledge hammer and went to work. I swung with all my might (insert your joke here) and hit the floor. Nothing. Again. Nothing. Time after time I hit the floor and nothing happened except a ringing in my hands and ears. Then, after many strokes of sledge hammer, a small crack appeared. As I continued, it grew. Finally, I broke through to the ground underneath. Not a subtle illustration, is it? Had I swung the hammer 25 times and given up, the hole would never have opened. I could have said, “It is insanity to keep doing the same thing over and over again and expecting different results.” Or, I could keep swinging the hammer until the hole opened. I am amazed at how prone God’s people are to giving up. I have watched excited, impassioned believers embark on a new ministry in the name of the Savior, convinced that they are answering the call of God. He (or she) has yielded to the eternal purposes of God and submitted his life to the plan that God has set for him. He is walking in obedience, even perhaps the costly and risky obedience that we have discussed. Then, something goes wrong. Someone criticizes what he is doing. Some detail or the other does not work out as he had expected. There are no immediate results or the response is disappointing. Perhaps, opposition arises inside the church or from the outside. And this significant servant, determined to do the will of God, just gives up. “I must not have heard God correctly.” After all, if God was really in it, all the details would work out, right? “I don’t have to put up with that.” Like the little boy who did not get his way on the playground, he takes his marble and just goes home. And that brings us to our next step in the process of becoming a significant servant of the Living God. We have been examining the great works of God in both the Old Testament and the New, looking at the elements that are common to each of these works. From that study, we have set forward five keys to becoming a significant servant. As we look at the fourth of these key steps, let’s review the first three. Significant service begins with yielding to the eternal purposes of God for your life. God is always working to glorify himself by redeeming sinners for Himself and transforming them to be like Christ. If we want to be significant, those purposes must become the driving force of our lives. Then, we must identify and submit to the plans of God for our lives, both the general plans that he has for all believers and the specific ones he reveals to each of us. Then, we must develop the first ERQ of significance. ERQ – that stands for Essential, Reproducible Quality. As I studied the great acts of God, I saw what I believe are two qualities of God’s servants that we need to be significant. They are essential in that they are required by God for significant service. They are reproducible in that they are qualities that God can produce in any person. Each of us can develop these qualities; they are not unique to talented or charismatic folks. The first ERQ is obedience. God’s people must do exactly what he commands. We must do what he says no matter what the cost or risk to our lives, our dreams or our plans. God’s plans and ways are seldom easy. There is a second ERQ, just as important as the first. In fact, the first ERQ, obedience, usually produces little or no fruit unless it is accompanied by the second. What is that second ERQ? Let us wander through some of these stories and see if we can identify it. Think for a moment of the life of Noah. God gave him a job to do; it was no small job. God revealed his purpose to Noah. He was planning to judge the world for its wickedness by bringing a flood. He revealed his plan to Noah. Noah was to build a boat that would hold him, his family and th animals that would repopulate the world. And Noah obeyed God. He started building the boat. Remember, there were no Lowe’s or Home Depot stores to order the lumber. He had to cut every tree and shape every board. And day by day that is exactly what he did. We know that Noah was 500 when his first son was born, and 600 when the Flood came. How many years did he build the ark? We do not know. But it was a long time. Day after day, week after week, month after month, year after year he continued to build this monstrous boat in his back yard. Can you imagine what the neighbors said? He was surrounded by wild, wicked folks and I can only imagine that they were none too kind to boat-building Noah. Noah may have explained that he had a reason, that the boat was going to save him when the rains came. But day after day, week after week, month after month, year after year it did not rain. The only rain that fell was the insults of the sinners around him. How long do you keep on doing what you believe God told you to do when what God said would happen has not happened yet? How long? Until the rains come! Noah kept building until the boat was done. Then the rains came. God did what he said! Consider Abraham. When he was 75 years old, having never been able to sire a child, he was told that he would be the father of many nations; one nation of particular import. The nation that would spring from his loins would be granted possession of the Promised Land, eternal Seed, and the blessings of God. Then, God waited. Abraham turned 80, then 85, then 90, and no baby came. In the middle of all this, someone got hold of him and convinced him that he could not continue doing the same thing over and over and expect different results. So they concocted a plan to use Sarah’s handmaiden to bear a son for him. It was a bad idea; one that has cost his descendents untold suffering for 3000 years. But still, God waited. Nothing changed. Sarah still had no children. How long do you wait for the promises of God to come true? How long? Until the promises come true. God does not measure time as we do. In his time, when Abraham was 100 and Sarah was 90, the baby came. God fulfilled his promise. Think of Joseph. At age 17, God gave him a dream; that he would be a ruler, even over his own family. Strangely, when he shared that vision with his brother, they did not appreciate it. And things went downhill from there. His brothers betrayed him, then sold him into slavery in Egypt. Can you imagine the pain of being betrayed by your own family? So, what did Joseph do? He became the best slave that Potiphar had. How was he rewarded? He was falsely accused of molesting Potiphar’s wife and thrown in an Egyptian dungeon. How did he respond? He became the most faithful and diligent prisoner in the dungeon. Then, forgotten by the cupbearer who promised to get him released, he kept serving God and others in the prison. How long do you have to keep doing the right thing when everyone around you is doing the wrong thing? How long do you have to keep holding on to the plans that God has shown you? How long? As long as it takes – until the day that God reveals his faithfulness. One day, God gave Joseph what he had promised. Joseph awakened a prisoner in the dungeon one day, then went to bed that night as the second most powerful man in the world. There is so much to remember about Moses. God sent him to Egypt to demand that the people of God be released. He did exactly what God said. “Let my people go,” he told Pharaoh. But Pharaoh did not respond positively. He punished Israel with extra work for Moses’ temerity. Moses was not a popular man. His approval ratings hovered near zero. He wanted to quit and go home. But God had a strange command. Didn’t God know that doing the same thing over and over again and expecting a different result is insanity? That is exactly what God said. Go back to Pharaoh. Again and again and again. Finally, Pharaoh let them go and Israel headed for freedom. But again he changed his mind. And there was Israel, backs to the Red Sea, cornered by mountains with the armies of Pharaoh descending on them. God’s people did the only thing they knew how to do. They complained to Moses. So, how long to you keep on serving God when everyone hates you? How long do you continue with little support and lots of criticism? How long do you keep obeying God when the armies of the enemy are bearing down on you and the Red Sea blocks your path? How long? Until the Red Sea parts and you go through in the power of God. Its perseverance, folks! That is the second ERQ of significant servants. They not only obey God, but they keep doing it when it gets hard. David was anointed king, then spent years fleeing from crazy King Saul. But he kept going until God fulfilled his promise. Joshua kept leading the people around the city until the walls fell. Thirteen time, even though nothing had happened on the twelfth time. Time and time again you see this pattern. God gives someone a job to do. They do it. Then it gets hard. Then the opposition comes. Then time goes by. But they just keep doing what God told them to do. They do it over and over again until the battle is won, until the victory comes. Every great victory in the kingdom comes when a man or woman of God is obedient to God’s purposes and plans, and keeps on doing it when it gets hard. There are some false preachers and teachers among us who proclaim a prosperity gospel – guaranteeing that faith will bring us health, wealth and anything that will make us happy here on earth. But even among orthodox, biblical Christians there is an attitude of false expectation. We seem to think that if we do what God wants us to do, everything will work out for us. One of my greatest times of discouragement in my ministry came after a time of great revival in my life and in my church in Cedar Rapids. I had a subtle expectation that because of my own walk with Christ and the things that were going on at the church, I had a right to expect that people would support me, that things would go well at the church and that I would be spared from opposition and hardship. Then, the hammer fell. One crisis after another hit me and the church. And I got mad at life; mad at God. I felt as if God had let me down and failed in his promises. Simply put, life in this world will be a battle against our own fleshly impulses, against the mindset of this world which is dominated by the lies of Satan, and against the forces of darkness at work in this world. It is a battle we will have to fight every day. But it is a battle that can be won. As we persevere in obedience, we can overcome the world as Christ did. We have to understand that obedience to God and to his purposes and plans for our lives is no guarantee that everything will work out for us. As a matter of fact, the Bible is clear that you can walk in complete obedience to Christ and things can still go horribly wrong for you. Things did not work out for Moses when he obeyed God and went into Egypt – not at first. David served God and still had Saul seeking his life. Read Paul’s account of his ministry in 2 Corinthians 11. Serving Christ was no picnic for him. If things are falling apart in your life, it is wise to do a spiritual inventory to see if you have done something to invoke the discipline of God. God corrects his children, and often uses the hardships of life to do so. But please hear this – you can be walking in complete obedience to Jesus Christ and still watch your life fall apart. It happened in the days of the Bible and it can happen to you. That does not mean that God has abandoned you or forgotten you. It just means you need to persevere and continue in the faith. Who is the biggest liar you know? Permit me to tell you of the biggest liars in your life, ones you may or may not even know about. Two big, fat liars constantly try to convince you that God’s promises will fail and he will let you down. First, circumstances in this world will tell you that God’s Word just cannot be true. Abraham’s circumstances screamed that he must forget the pipe dream of being the father of many nations. It was impossible. How could marching around Jericho lead to victory? Should Gideon have trusted his little army of 300 against the powerful Midianites? In Cedar Rapids, we approached the process of building a much-needed new building carefully and prayerfully. Finally, after a long time and much prayer, we were confident that God was leading us to build. We voted to do so and proceeded in the process. Between the time we voted to build and the time the building was done, God chose to remove six or seven of our pillar families from the church. It seemed like every week another key family was coming to me and telling me that God had led them to Alabama or North Carolina or somewhere else very far away. Had we known that they would be moving, we probably would not have built the building. Circumstances told us that we should not have done what we did. Circumstances were lying to us. There is another liar, perhaps more blatant than your circumstances – your emotions. Your feelings will tell you that God has forgotten you or abandoned you, even though he promised he would not. You will panic, lose heart, or grow fearful. Unless we are walking in the fullness of the Holy Spirit, our emotions tend to be fed by the flesh. But significant servants do not listen to the whisperings of despair, fear, anger or hurt. They listen to the Word of God – with single-minded intent. They purposely refuse to let their emotions convince them that God has failed. That was my problem in the time of discouragement I mentioned above. I listened to my emotions instead of the truth of God’s Word. But when you obey God, when you continue to obey him after things get hard, when your life falls apart but you continue to hold on to the hope of his promise, when you ignore the quiet deception of your own emotions to listen to God’s Word and continue in faith and obedience, God will work his mighty works through you. Every great work of God in the Bible was the product of obedience accompanied by perseverance. When hardships discouraged people, they continued in obedience. When the passage of time disheartened them, they held on to the promise of God in faith. And when opposition arose and withered their courage, they kept plodding along day by day until God released his power. So, “insanity is doing the same thing over and over and expecting different results”? Really? If what you are doing over and over again is the command of God, if you are obeying God and persevering in his promise, then it is not insanity, it is the path to significant service. Jonathan Edwards was in the pastor of a church in Northampton, Massachusetts in the early 1700’s. He labored faithfully and preached God’s Word for 17 years with no visible effect, no response from the people. Can you imagine what would happen to a pastor who had not a single convert after 17 years of ministry, whose church had not grown or seen the power of God revealed? We would tell him that it was insanity to keep doing the same thing over and over again and expect a different result. We would tell him to get some new methods or go to a new place. But Jonathan Edwards kept preaching until revival fell. One day, a young man was killed in a farming accident. A young lady, one described by Edwards in less than flattering terms, suddenly came under the conviction of sin and was gloriously converted. Others, seeing the change in her life, also began to come under conviction. This revival was so sweeping that after a couple of years, Edwards said that everyone in Northampton had been converted. The revival spread throughout the colonies and is known in history as the First Great Awakening. God is responsible for revivals, but he uses human beings in the process. And the First Great Awakening came, on human terms, because of one insane man who kept doing the same thing over and over again until God brought a different result. If you have died to self and are walking in the eternal purposes of God, if you have discerned the plans of God for your life and are obeying him, then continue doing the same thing God told you to do, over and over again, until the power of God falls on you! Again, I am not arguing for the kind of knee-jerk traditionalism that stifles so many churches. Healthy Christians grow in Christ. Healthy churches grow. The nature of growth is change. The very nature of Christianity is leaving behind the life we had to embrace a new life lived under Christ’s Lordship for God’s eternal purposes. But when God has spoken, his people must continue doing what he has said. We must continue to preach an accurate gospel even if the world wants their ears tickled. We must continue to proclaim God’s holiness even if people want a different God, one who has no standards. We must continue to obey God no matter how difficult it is, no matter how many enemies come against us, regardless of the challenges or discouragements that come our way. We obey God and we keep on obeying God until the harvest comes, until God opens the door for our significant service to him. Thought you might be interested in this credible news report. I was witness to an interesting conversation some years ago. My father, a Southern Baptist pastor and missionary for half a century was debating a pastor from a small Eastern denomination about how pastors were selected. Baptist churches are in charge of their own pastoral selection, using pulpit committees to sort resumes, ask questions and select a pastor to recommend to the local church. In the other pastor’s denomination, the local denominational representative selected and appointed the pastors and the local church had very little say in the matter. It was an interesting debate. My dad maintained that no system could be less effective than the Baptist system. The other pastor disagreed. He maintained that the power politics inherent in his system had to be worse than the independent system of Baptist churches. Selecting pastors and church leaders is not an easy task. How often has a church voted with enthusiasm to extend a call to a new man, embracing him with excitement, only to develop a severe case of buyer’s remorse within the next year or two? I spent a year and a half as First Vice President and two and a half years as President of the Baptist Convention of Iowa. We had many discussions about the difficulty of attracting and holding on to qualified, capable and faithful pastors for our churches. When we found the right man for the right job, things seemed to click and some successful churches have been planted. But way too often we found square pegs to fit round holes and after one Iowa winter the pastor headed back to the south. I know of a church in Florida that was thriving and growing, until the pastor that had led that growth resigned to pursue different ministries. The people of the church were thrilled when one of the luminaries of our denomination recommended the “perfect” man for the church. And he was an amazing candidate – good looking, impressive, gifted speaker, charismatic personality and presence. Actually, he had a lot of the same character qualities as Saul, the first king of Israel. What no one knew was that behind the impressive exterior was a heart of immorality and greed. It took him only 7 years to reduce that once thriving church to about fifty people. The candidate’s promise morphed into a pastoral nightmare. Many who are involved in Christian organizations will tell you that finding qualified leadership is their most challenging task. Who of us does not know of a church or Christian organization that has had serious problems because of the actions of or conflicts with a leader? So, that makes this question essential: what does it take to be an effective leader in the Kingdom of God? Or, perhaps more fundamentally, what is required of me to become an effective, significant servant of God? We have studied the first two steps in this process. To become significant in God’s Kingdom, we must die to self and yield ourselves to the eternal purposes of God. We must then seek the specific and personal plan that God has for our lives. These are revealed by God as we submit ourselves unreservedly to him. God reveals his purposes. God reveals his plans. But is there anything that I have to do? Is anything required of me to become significant?
. On October 1, 2000, I began the longest sermon series of my life on Sunday nights at Northbrook Baptist Church. It was called, “Through the Bible, Hopefully before Jesus Returns.” We started in Genesis and worked our way book by book through the Old Testament. On August 14, 2005, the last Sunday night I preached at Northbrook, I finished the Old Testament. It was the study that formed the basis of what I am teaching in this series. As I began the series, I was in at a point of frustration with my own ministry. I read the scriptures and saw God working in power throughout them. But I looked at my life, my church and the churches around me and felt as though there was little of that power being revealed today. So, as I studied Noah, Abraham, Joseph, Moses, Joshua, Samuel, David and so many others, I asked myself what made them tick. What made these people successful in Kingdom work? I began to notice a trend, a pattern in the way God worked. One thing became clear to me. These men would never have been selected by leadership experts as models of efficiency or administrative efficacy. Most were not impressive in human terms. We value talent, charisma, or force of personality, creative problem-solving and innovative strategy. These were the abilities that got King Saul in trouble. He was everything we value today in a leader. In God’s eyes, he failed. Human abilities do not produce Kingdom success. God saves us by grace, not our own merit, and He chooses and uses leaders by that same grace. It is not our merit, or talent, or ability that matters, but the power of God within us. God chose ordinary people – people just like you and me – to do his work. God is not a talent scout, looking for the best, the brightest, orthe beautiful to accomplish his kingdom work. Look at 1 Corinthians 1:26-31. “For consider your calling, brothers: not many of you were wise according to worldly standards, not many were powerful, not many were of noble birth. But God chose what is foolish in the world to shame the wise; God chose what is weak in the world to shame the strong; God chose what is low and despised in the world, even things that are not, to bring to nothing things that are, so that no human being might boast in the presence of God. And because of him you are in Christ Jesus, who became to us wisdom from God, righteousness and sanctification and redemption, so that, as it is written, ‘Let the one who boasts, boast in the Lord.’"
In case you were wondering, this passage is not a compliment to you or me. God does not choose the human intelligentsia to accomplish his work. He chooses the foolish ones to proclaim his wisdom. God does not choose the strong and mighty to advance the borders of his kingdom. He chooses the weak. His power is make perfect in our weakness. He does not choose the influential, powerful and popular. He chooses the lowly people, those the world treats as if they do not even exist. And with these foolish, weak, lowly folks, God by his own power and grace confounds the wise, defeats the strong and nullifies the powerful. He makes his purpose clear in verse 29. “So that no human being might boast in the presence of God.” God delights to take people whom the world views as ordinary and lacking in ability and pour out His power on them. He does extraordinary works through ordinary people, for one very clear reason. He wants the credit and the glory. Those with great talent and ability may believe that they should receive some of the glory. God will not share his glory and chooses to work primarily through those the world rejects and scorns. Are you average? Ordinary? Just a normal person? No one special? Congratulations! You are a prime candidate for the powerful work of God. Are you massively talented and gifted? Do not worry. God can still use you, if you humble yourself. Notice that the passage says “not many.” Talented and gifted people can serve God. But God is not a talent scout or a leadership guru. He does not need your talents and does not rely on your wisdom and insight. He is a powerful God who works through ordinary people to do extraordinary things so that he will receive the glory. He wants fools who know they cannot figure things out on their own and will look to him for wisdom. He wants weak people, who will depend on him for strength. He wants the lowly, who will give him all the glory for the work that is done. He wants the “things that are not,” – the people who just don’t matter in the eyes of other people – for significant service to him. As I marched through the Old Testament, looking at the significant servants who accomplished great acts of power in God’s name, I began to identify two “ERQs” – Essential, Reproducible Qualities. These are character qualities and behavior patterns that marked God’s most significant servants. They are “essential” qualities. If they were present, the person accomplished significant work. If they were not present, nothing of spiritual or eternal significance was accomplished. God requires these qualities to be present when he uses someone for his purposes. And the qualities had to be “reproducible.” If God said, “I will use redheads to accomplish my work,” I am out of luck. Unless I get some help from Clairol, I am not nor will I ever be red-haired. If God only used tall people, my 6’4” frame might qualify me. But what good would it do to identify these things? They are not reproducible qualities. You are either tall or not, red-haired or not. But the qualities I will be describing, one here and one in the next message, are both essential and reproducible. You will never be significant unless you possess these characteristics – they are essential. But you can possess them – they are reproducible in your life. Whether you sing or not, you can have these ERQs. Whether you are tall or short, charismatic or dull, good looking or not, these essential, reproducible qualities can become part of your life so that you will become a significant servant of God. The God who worked through the great men and women of history can work through you. Let us look at some of the earliest acts of God and see how the pattern developed. God spoke to Noah and revealed his purpose to him. God was going to judge the world with a flood. He also revealed his plan. Noah was to build a boat. What happened next? Noah took the plans that God gave him and began to build the ark. He obeyed God. God revealed his purpose to Abraham, that he would be the father of a great nation through which God would bless the world. He also revealed the plan he had for Abraham. He was to leave home and go to the Promised Land, the land God would show him. What happened next? Abraham left home and headed toward Canaan. He obeyed God. When God revealed his purpose to Moses (to redeem Israel) and his plan (to send Moses as his representative), Moses was flabbergasted. In Exodus 3 and 4, Moses offers five powerful excuses why God must have chosen the wrong man. It is interesting how often the men God chose tried to argue that they were not right for the job; that the job was beyond them. They were right. The job was beyond them, but wholly within the power of Almighty God. But, once Moses’ questions were answered, we see what he did next. He packed up and headed by to Egypt. He obeyed God. Both Moses and Solomon were called to be a part of God’s purpose to provide a place of worship and sacrifice for the people of God. Not only were they called to the purpose of God, but they were also given detailed plans on the building process. Read the later chapters of Exodus, especially chapters 39 and 40. Watch how often it says that Moses did everything exactly as the Lord has told him. When the process was done, the glory of the Lord filled the tabernacle. Solomon built the temple according to the plans God had given and the same glory filled that temple. Those who wish their lives to be marked by the power and glory of God would do well to do just as they did – to walk in complete obedience to God. In the divine system, obedience precedes the experience of glory. From the beginning of time to today, the first essential, reproducible quality any servant of God can have is obedience. In fact, it is the chief American religious conceit that we can experience the blessing, presence and power of God without submitting our lives in obedience to him. We have reduced the love of God to a lack of standards, acting as if God were a spineless wimp. He is not. Those who would experience his presence and power, who would be significant in his service, must yield their lives in obedience to him. A young couple came into my office, asking me to perform their wedding. They were living together and I confronted them about their sin. They were living contrary to God’s revealed will and yet expected me as a pastor to stand before a group of people and declare the blessing of God on their lives. They left my office angry at me. They simply could not see the idea that God would expect them to control their desires or to obey his laws. They assumed they could seek his blessings regardless of their lifestyle. They are, I am afraid, typical Americans. But it is a clear and uncontroverted pattern in scripture. Those who experienced the power and presence of God first submitted their lives to God’s purposes and plans. They obeyed God. I am amazed at the expectations that many Christians have exhibited. We expect that if we obey God, there is some kind of guarantee that everything will work out fine. We seem to believe that obedience is our means of avoiding hardship, hurt and pain. This is simply not true. In fact, in the Bible, obedience was costly and difficult. God called people to acts of obedience that were difficult; that cost them all they had. God is clear about what is at stake here. He identifies Abraham’s son, his “only son Isaac, whom you love” as the target of the test. Whom did Abraham love more, God or the gift God gave him? Would Abraham obey God even at the cost of his son? We often assume that Jesus did not mean some of the things he said. Luke 14:26 says, “If anyone comes to me and does not hate his own father and mother and wife and children and brothers and sisters, yes, and even his own life, he cannot be my disciple.” That is a simple and straightforward statement, but it is also shocking. If you want to be Jesus’ disciple, you must hate your family and even your own life. It is so radical we assume Jesus did not mean it. He did. “Hate” is not an emotional term here. It is an action word. To hate someone is to choose someone else over them. Jesus is telling us that we must choose him first over family, friends or anything else in this whole world. Abraham had a chance to apply this principle. God told him to take his only son to Mt. Moriah and to sacrifice him there. Genesis 22:3 is one of the most amazing verses in the Bible. “So Abraham rose early in the morning, saddled his donkey, and took two of his young men with him, and his son Isaac.” It was a costly decision for Abraham, but he did not struggle. Early the next morning he set out to do the very difficult, unbelievably costly thing God told him to do. And God intervened. Our obedience can be costly. God does not intervene in our lives to help us be more successful in the lives we had. He calls us to lay down those lives, to leave them behind to follow him. Jesus came to his disciples and called them to leave their fisherman’s nets behind and follow him. Every time someone decided to follow Jesus, they had to leave their lives behind to do it. Sometimes, when we lay down our lives, those things are gone. Perhaps God will call you to give up a successful career or put your talents on hold. I know a successful surgeon who heard the call of God to leave his practice to serve as a missionary. Often, God gives us back what we have given up; sanctified and ready to be used in his service. But when we come to him, it is as living sacrifices – all on the altar. When I was a young preacher, I was willing to go anywhere God wanted me to go, as long as it was in the United States. I just was not willing to go oversees as a missionary. Then, in 1984, I went to Honduras on a mission trip. In 1988, I went to Honduras in the spring and Tanzania, Africa in the fall. During this time, my heart began to change about missionary service. The next summer, at a camp, I sensed a call to mission service and Jenni and I applied to become missionaries. I had given up the United States to serve the Lord. Then one day we got a letter in the mail telling us that because of a medical problem in one of our children. I have spent my life serving American churches. But I could not serve God in America until I was willing to serve him anywhere. Our obedience to God is costly, but it brings the great blessing of God. When is the last time you did something risky in obedience to God? I’m not talking about jumping out of airplanes or driving at high speeds. I’m talking about putting your life on the line in such a way that if God does not act, we will die or suffer great shame and humiliation. No, some would say. God would never ask us to do something foolish like that. Really? God sent Moses into Egypt to face Pharaoh. If God does not act, Moses would die. David went up against Goliath, hopelessly mismatched. If God did not walk into battle with him, David would die. Joshua’s plan against Jericho could only succeed if God released his power. Time and again, God sent his people into battle against overwhelming odds and overpowering foes with only the promise of his presence. But when they went into battle, obedient to Almighty God, they were victorious regardless of the odds. In 2003, a terrorist exploded a bomb in the Davao City airport in Mindanao Island in the Philippines, killing a friend of mine named Bill Hyde. I was asked to take part in his funeral, along with Dr. Jerry Rankin, President of our International Mission Board. He called me a couple of days before the funeral to talk over the service. When I was an missionary kid in Taiwan, I lived in safety. Dr. Rankin told me that this is a dangerous world for missionaries. I received a call from Fox News and was on Great Van Susteren’s show “On the Record.” She asked, with some amazement, why we would continue sending people into places where their lives were at risk. I think she thought it irresponsible. But I told her that we had a job to do, a commission to obey. I told her that Bill was more committed to the service of the Lord than to his own safety. Bill had a life of significant service to God and even his death was a great testimony to the work of Christ, because he obeyed God even at great personal risk. There is a story in the book of Joshua that explains why we do not see the power of God. Israel came to the Jordan River when it was at flood stage. In Joshua 3:13, God told Joshua to have men carry the Ark of the Covenant and stand in the River. This was a foolish, risky act. When they stepped into the river, the water would stop flowing and the people would go through on dry ground. Note the sequence there. The men carrying the Ark had to step in the river first, then it stopped. Had they stood on the shore waiting for the flow to stop, they would not have gone across. Imagine being one of the men holding the pole that carried the Ark. You have to take that step of extreme faith and obedience into the river knowing that if God does not do as he said, you will drown. But those men stepped in the river and the power of God was released. We stand at the river telling God that as soon as he stops its flow, we will walk through in faith. He says that we must step in. We are called to risky obedience, to act in ways that all we have is on the line. We want to walk by sight, but we must learn to walk by faith; by an obedient, costly, risky faith. As I studied through the Old Testament, I began to see what made someone a significant service. Few of these were men of natural talent or ability. They were not charismatic personalities. But they did share an essential, reproducible quality. It was pretty simple. They went where God told them to go. They did what God told them to do. They said what God told them to say. And God worked his power through them. It does not take amazing talent to serve God. You do not have to be creative or charismatic. Just seek God until you know his will – and do it. Go where he wants you to go; do what he tells you to do; and say what he tells you to say. It is helpful to know the Lord’s Prayer. It was given to the disciples as a model for our prayers. And it is good to study Jesus’ prayer in John 17, in which he poured out his heart to the Father the night before he died. But I would suggest a five word prayer that would set us on the path to significant service to God. I just read an AP article (http://news.aol.com/article/edwin-chandler-cleared-in-slaying/716286?icid=main|main|dl1|link3|http://news.aol.com/article/edwin-chandler-cleared-in-slaying/716286) on AOL about Edwin Chandler who was exonerated on a 1993 murder after spending 9 years in jail. New evidence proved him to be innocent. I am a conservative, law-and-order man. I love America and respect our law enforcement system. But, here is my question: When is the last time you saw an article like this and the person it was about WASN'T black? How many Edwin Chandlers are there out there in jail and the only crime they are really guilty of is having dark skin (or at least a primary contributing factor)? I don't know the answer to that. But I do know that every time I read a story about someone being proven innocent after 10 or 15 years in jail, that man is black! That cannot be a coincidence! Significiant Servants September 20&27, 2009 "God's Wonderful Plan for Your Life"
(NOTE: This is a compilation of my sermons from 9/20 and 9/27. Basically, it was a do-over. I did not find I liked the way I had approached things on the 20th, so I pushed the reboot button. This lengthy message is those two sermons combined, edited and even expanded). God loves you and has a wonderful plan for your life. That is the famous opening line of perhaps the most-used evangelistic tract in history, the “Four Spiritual Laws.” A whole generation of Christian witnessing efforts has been based on this evangelistic strategy. It has also been criticized as too man-centered, too focused on the personal benefits of salvation, not serious enough about sin and lacking in a treatment of the Lordship of Christ. The cartoon above encapsulates those criticisms. It depicts Christians in the Roman Coliseum, awaiting a martyr’s death at the jaws of a lion. The caption sarcastically promises them that God loves them and has a wonderful plan for their lives. It is hard for American Christians to realize the suffering that our brothers and sisters have experienced through the years and, in fact, are now experiencing around the globe. On August 3, 2009, The New York Times carried a chilling story of a family of seven Pakistani Christians brutally murdered by a Muslim extremist group. They died for no other reason than the fact that they were followers of Jesus Christ. Did God not have a wonderful plan for their lives? But I am here today to affirm that God does love us and does have a wonderful plan for our lives. In Jeremiah 29:11, God promised Israel that he had plans for them, plans “for welfare﻿ and not for evil, to give you a future and a hope.” Romans 8:28 promises those who love God and have been called to live according to his purposes, that God “will work all things together for good.” He has an amazing and magnificent plan for our lives. It will bring us spiritual growth and prosperity in Kingdom work. It will give us hope for the future and allow us to bring hope for the world. His plans for us will be very good. But here’s the rub. Too often, when people talk about God’s wonderful plans for our lives, they can get the idea that “wonderful” implies a life of ease, comfort, freedom from suffering, pain, sickness or hurt of any kind. We assume that God’s wonderful plan for us is that we will have all we want, succeed in all we attempt, enjoy every day and have all our dreams come true.That is a very human form of wonderful. God’s wonderful plan for your life may have a very different outcome. His plan is that you will have a significant life of service to him, that your life will count for all eternity. In 2 Corinthians 11, Paul recounted the details of God’s wonderful plan for his life. It involved being beaten, shipwrecked, stoned with stones, and all sorts of assorted sufferings. But he reveled in the plan of God, because in his weakness, he became strong. In his suffering and hardship, Christ revealed himself in a powerful way and used him to make an impact on the lives of other in the name of Christ. Does God love you? He proved that at the cross when he sacrificed the body and shed the blood of his beloved Son to pay for your sins. That question is settled. Does he have a wonderful plan for your life? Absolutely. But you cannot define “wonderful” by your own standards.Wonderful to God is something very different. God loved Noah and had a wonderful plan for his life. That plan required that Noah work hard, without reward and under intense ridicule and disdain, for many years until the ark was complete and God made the animals come and the rains fall. God loved Moses and had a wonderful plan for his life. That plan required Moses to walk on the edge of death for many years, to go to the most powerful man on earth and try to tell him what to do. God loved Abraham and had a wonderful plan for his life; a plan that required Abraham to wait patiently for 25 years until God fulfilled his promise about Isaac’s birth. God loved David and had a wonderful plan for his life, but David still had to face a giant, then spend years running from the king who wanted to kill him. He hid in caves and among the Philistines until God delivered on the plan and David became King of Israel. God loved Elijah and had a wonderful plan for his life. That plan put Elijah on Mt. Carmel facing 850 false prophets and one wicked queen. 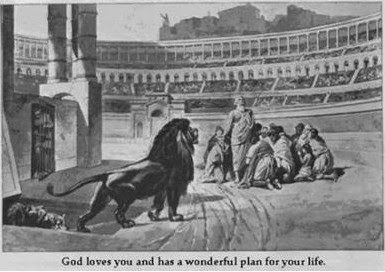 And God loved those Christians in the Coliseum awaiting death and had a wonderful plan for their lives. They would testify to Christ by giving their very lives in his name. Today, we will look at the perfect plan that God reveals in the lives of his followers – that wonderful plan that he has for each of us who has been redeemed by the blood of the Lamb. In our last session, we focused on the threefold purpose that God has for his followers. He works to glorify himself by redeeming a people for himself from among the sinners of this wicked world.He then transforms those sinners to be just like Jesus Christ. That is what he is doing in your life.Your job is to die to self, to die with Christ to the life you had without him, to all the human goals, purposes, dreams, desires and ambitions that came from your sinful heart. You are then risen to walk a new life with Christ and to serve the eternal purposes of the Father. Now, it is time to explore the plans that God has for his servants. The church in America has adopted a corporate strategy, structure and planning philosophy to accomplish the work of God. When a church wants to grow, they hire a consultant or study a curriculum that will help them “re-dream the dream.” They determine their vision and goals for the church, then develop a long-range plan to accomplish that vision and set goals and objectives to measure their effectiveness. There are some pastors and church leaders who have the arrogance and temerity to believe that they have the right to determine the vision and direction of God’s church. They ignore the fact that God has already given us his vision (to make disciples in all the world) and has revealed his purposes for the church. We are simply to bring our lives in line with what God has revealed. We cannot alter that or improve on the purposes that God has set. But there are many who, while they understand that they must submit to God’s purposes, then make the false assumption that God has given us his purposes and then told us, “Now, go figure out how to get the job done.” He reveals his purposes, then leaves it up to us to figure out how to accomplish those purposes. I do not find that model revealed in scriptures. In this study, we are looking at the great acts of God in Scripture, looking for a pattern that we can follow. If there is a pattern to the significant work of God in the lives of the biblical heroes, then perhaps there is a pattern that we can follow to become significant in the service of God. We have already looked at step one in that process – submitting our lives to the eternal purposes of God. Now, we will examine the second step as God reveals the wonderful plans that he has for those he loves. If we submit to God’s purposes and follow God’s plans for our lives, we are on our way to significant service in his name. How did God’s people come to understand what God wanted them to do? Did God reveal his noble purpose and then say, “Now, figure out a strategy and come up with an action plan to get the work done?” I would argue that there is not a single instance in scripture where God did anything that in any way resembles that. In fact, it was just the opposite. When God revealed his purpose, he also revealed a detailed and complete plan for what his servant was supposed to do. In Genesis 6:13 God revealed his sovereign purpose to Noah. “I have determined to make an end of all flesh.” Then, verse 14, God revealed his plan. “Make an ark of gopher wood.” Note how specific God was. He told Noah the length, width and height, the building materials and the design. Not only did God reveal his purpose, but he also revealed a specific, detailed plan for how to get the job done. All Noah had to do was obey. In Genesis 12, God spoke to Abraham, revealing the purpose he had determined for Abraham’s life. Abraham would be a great nation, a nation through which the entire world would be blessed. The revelation of the purpose of God was accompanied by a revelation of God’s plan.In Genesis 12:1, God ordered Abraham, “Go from your home and your country and your father’s house to the land that I will show you. As is always true when God reveals his plans, Abraham’s life was going to change dramatically. “You cannot stay where you are and go with God.”Blackaby’s words are so true. God’s purposes and plans for our lives require a new direction and new plans – big changes for significant service. God revealed to Moses his purpose to deliver Israel to Moses, then told Moses to go toEgypt and face down Pharaoh. God’s purpose for Israel included God’s plan for Moses. Joshua was called to lead Israel in taking possession of the Promised Land, but he was not left to figure out his own plans. In fact, the one time that he did things his own way, Israel suffered a horrible defeat at the hands of little Ai. But, when they faced the walled city of Jericho, they followed the very detailed and specific plan that God gave them and the victory was one. God was ready to put into effect the plan devised before time began for Christ to come to earth in a human body.He appeared to a maiden in Nazareth, a young girl named Mary. Not only did God reveal his redemptive purpose, but he made it clear that his plan included Mary. She was going to have a baby. Over and over this same pattern is seen. God reveals his purposes – what he is doing here on earth. Then, he reveals his plan for how that work is going to be accomplished. You cannot accomplish the purposes of God with your own plans. If we would serve the purposes of God, we must do it God’s way, following his plans and purposes. How Do We Find God’s Plan? The problem for many of us is very practical. How do we discover those noble plans that God has for us? It does not do any good to say we can only follow God’s plan if we do not have a way of discovering those plans. I believe that each of us is called personally by God, called to God and to a life of significant service in his name. And, I also believe that we can look at the life of the Apostle Paul, the most significant figure in the New Testament (other than Christ) and see a pattern for God’s revelation of his plans for all of us. There are three clear parts to God’s call on Paul’s life. Those same three calls go to each of us. As we respond to the gracious call of God, the threefold call, we will find ourselves on a path to eternally significant service in Christ’s name. On the road to Damascus, Saul of Tarsus was assaulted by God. I know that is a strong word, but how else can you describe that encounter? God knocked him to the ground and Saul was blinded by the light of the glory of our Savior. God called Saul to turn from his life of sin and trust Jesus Christ, yielding his life to him. It was a strange encounter, and those words were not used, but in essence, that is what took place. Saul of Tarsus died that day. The name change did not occur until later, but the life-change began then. Saul of Tarsus was devoted to a purpose – the destruction of “The Way”, those who followed Jesus Christ as the Messiah of Israel. He headed to Damascus breathing out murderous threats and met Jesus along the way. On the ground, hearing the voice of the Savior, Saul died. He died to the purposes and goals he had lived for. A new man was born that day. Paul the Apostle emerged slowly from the death of Saul of Tarsus. He had new life in Christ and a new purpose for his life. He now lived for the glory of God, for the gospel of Jesus Christ, and for conformity to the image of Christ. It was a startling transformation; one that others like Ananias had trouble adjusting to, but it was real. Saul experienced salvation in all three tenses. He experienced the grace of God at a point in time and was saved (past-tense) on the road to Damascus. He lived in the grace of God and was growing to become more like Christ (present-tense). He also looked forward to that day in which his faith would become sight (future tense) and he would be glorified and receive what Christ had promised. For most of us, salvation is not that dramatic. I was not cast to the ground when I was six, I did not hear a voice from heaven, nor was I cast to the ground by a heavenly light. But the same thing happened to me. I was called to salvation by the sovereign grace of Jesus Christ. The first call of God is the call to salvation and sanctification which each of us must receive. I hear the word “missional” a lot today, but I have never been able to get a firm fix on what it means. In my day, we talked about being “mission-minded.” Today, missional is the buzz-word. If I understand it at all, I think the idea behind the word is broader than what mission-minded has implied. Being mission-minded means supporting missions work with prayer, offerings, education and perhaps a mission-trip now and again. Missional means that we see our lives as being lived on mission, by the purposes and plans of God. If that is accurate, then Paul was missional and you and I should be as well. When God called Saul to salvation, he was also calling Paul to a mission which he had designed for his life. It was a significant ministry, unique to Paul; one God had prepared specifically for him. There were two aspects to Paul’s call to be on mission. You do not need to pray about whether God has a mission for you. It has been revealed clearly. We have all received the same general call from God. It came just before Jesus Christ left this earth. Our commanding officer left us orders that we must follow obediently. We need no new revelation or leading of the Spirit for these. They are our revealed and binding marching orders, recorded in Matthew 28:18-20. While we are going on our way throughout this world, we are to make disciples of all nations, first by baptizing them (representative of evangelism) and we are to teach them obedience to all Christ has commanded (the process of discipleship). Jesus added in Acts 1:8 that we would give constant testimony (be witnesses) to the life-changing power of Jesus Christ to the ends of the earth. These are not suggestions, they are commands. They reveal the plan of God for each of our lives. If your sins have been paid for by the sufferings of Christ, if the blood of Christ has been applied to your heart and Jesus Christ has forgiven you of your sins, raised you to a new life in Christ and given you life eternal and abundant, you have life-defining orders from him today.You are to be involved at some point in the Great Commission. It is not an option. Your life is not meant for temporal things, for the pursuits of the world. God has a purpose and a plan for your life that is incumbent on all believers, a plan to take part in the Great Commission. That is a general call that goes out to each believer. But it does not end there. He also received a very specific call from God. God has a plan for all believers, but I believe he also has an individual call for each of us. Paul’s was revealed first just after his conversion on the Damascus Road. The call went out to Ananias to go and meet with Saul. He was understandably reluctant. Saul’s reputation preceded him. But God told him, in Acts 9:15-16, “But the Lord said to him, ‘Go, for he is a chosen instrument of mine to carry my name before the Gentiles and kings and the children of Israel. For I will show him how much he must suffer for the sake of my name.’” Saul was God’s chosen instrument to carry the name of Jesus to the Gentiles. It was a unique and personal call on Saul’s life. The Apostles had focused their ministry on Jerusalem. In fact, until Saul’s great persecution recorded in Acts 8, they had not left their homes to carry the gospel to the world.But God had a plan. He confronted Saul on the road to Damascus and then called him to be the apostle to the Gentiles. It was a plan that was specific and unique to Saul. It was “go-time” for the gospel to be given to the Gentiles. God was not content that the disciples huddle in Judea and Samaria, he wanted them extended to the ends of the earth, as he had commanded. So he came and gave a very specific and personal call to the church about Barnabas. He said whom he wanted and what he wanted them to do. The church sent them off to do what God had intended for Saul to do. On that first journey, he became Paul and devoted the rest of his life to the specific, personal call that God had placed on his life. You may be objecting at this point that you are not Paul or an apostle of any kind. I would argue that God has such a personal plan and specific call for each of us who is called into theKingdom of God. Every one of us has an important part to play in the working of God’s kingdom.We are called, together, to obey Christ’s Great Commission. But each of us has our own important, specific, and unique place in the work of that Kingdom, a work which God reveals to us in his time. Whatever else one would say about spiritual gifts, the clear implication of this passage is that God gives each of us the manifestation of the Holy Spirit in a unique way. The Spirit apportions to each one individually as he wills. You have a gift or gift set, a calling that is unique to you. God has specific plans, goals and aims for your life. Your job is to figure out what it is that he is wanting for you and from you. How do you find those gifts, that specific calling? It is more of an art than a science, but I believe that you begin by serving. When I got right with God, I was drawn toward teaching the Bible. When I began to teach it, people seemed to be blessed by that. It became clear to me that the primary call of God on my life was to teach the Word of God to lead God’s people to obedience. You may be someone who has a call to focus primarily on evangelistic ministries. Leaders from one of the nation’s key evangelistic ministries observed that in most church they go into, 10% to 15% of the people who go through evangelistic training come to sense that they are called into a ministry that focuses on evangelism. How effective would the church be if it identified, trained, funded and supported 15% of its people in ministries outside the walls of the church – reaching out in the name of Christ to those in need. Others of you may focus, as I do, on Bible-teaching ministries. Some are devoted to service in the name of Christ – meeting the practical needs of the church and the people of the church. Many have a gift of mercy or exhortation – helping the hurting, the needy, the oppressed to find strength, comfort and healing. Some are given the gift of giving – a special call to financially support the ministries of the church. Others have gifts of administration and organization that pastors like me need desperately. Each of us must identify our specific gifts and realize the call that God has placed on us, then begin to minister with power and grace in the way God intended. Paul was called to salvation by God’s grace. We were called to that same cross and that same Savior. Paul was called to serve God as an apostle to the Gentiles. I was called to be a teacher of God’s Word. You (if you are saved) have a gift set that God has given you to serve the Body of Christ. But I believe that the call goes a little farther. Paul was not only called to be an apostle to the Gentiles, but God also gave him very specific and details instructions about that call. I was not just called to a ministry of teaching, but I believe that I was called to a ministry of teaching at Southern Hills Baptist Church in Sioux City, Iowa. I was in Cedar Rapids for over 14 years and would have been content to stay there for the rest of my life. Then, God worked through circumstances, people, and my prayers to direct me to leave my home and head west to Sioux City. This is a fascinating passage. There are some today who say that God has given us his Word to guide us and that we should not expect anything beyond that. We are to read the Bible, study it, follow its teachings and not expect specific leadings, promptings or guidance. God may have a general will for my life, but they do not believe he has a specific will. I can marry whom I desire to marry, as long as she is within the bounds of scripture. I can minister where I wish to minister, Cedar Rapids, Sioux City or somewhere else. They would not believe that God has a specific, detailed plan for our lives. Your challenge is to find your own Macedonian ministry. You must be born again by God’s grace, called to salvation in Christ. You must be submitted to the powerful, eternal purposes of God – his plan to glorify himself by redeeming sinful people and transforming them to be like Christ. You must also accept his plan for your life, to be a servant of the Great Commission, making disciples by testifying by your life and words that Jesus Christ is Lord of all. You need to find out what your gift and calling is, that which the Holy Spirit has apportioned to you for service in the Body. Those steps are crucial; none of them may be skipped without nullifying the entire process. But, once you have received the call to salvation and submitted to God’s purposes for your life, and accepted the general plan of God to be a testimony of Christ’s transforming power, you then need to seek out the Macedonian ministry that God has for you. It should never be enough to just do whatever the nominating committee pressures you to do. Seek God and be led by him. I am convinced that there are many Christians who have never left Antioch. Whatever plans and purposes God has for your life are going unfulfilled because you refuse to leave the life you are living and follow God on the great adventure of faith.Some may be ministering in “Asia Minor” and finding frustration in spite of all their efforts.There is little fruit because the time is not right and the harvest is not ready. Other may be willfully following their own plans and going to Bithynia, even though the Spirit has directed in a different direction. God directed Paul to that specific place of significant service – Macedoina.God called Paul to salvation, to his purposes and to his general plan. But he also had a very specific personal plan for him that guided him step-by-step on his journeys. And it is not just Paul. God called Noah to build a boat then gave his detailed directions.God sent both Joshua and Gideon into battle with unique, odd, but specific and detailed plans.Both the tabernacle and the temple were built according to very clear directions of incredible detail revealed by God. The idea that God gives us general principles and calls us to live obediently by them, without specific direction has very little biblical support. God chose the people for his worldwide mission (Barnabas and Saul). He revealed the purpose (carry the gospel to the Gentiles). He gave them directions (Macedonia, not Asia orBithynia). His directions were personal, specific and details. I do not often hear voices in my head (comforting to all, I hope). But there have been times in my life when I sensed the strong leading of God. I was about a week away from leaving for seminary, when I sensed God speaking strongly to me that I should marry Jenni and take her with me. I did. After two years at Dallas seminary, I was laying awake one night, unable to sleep, and I had a clear direction that God wanted me back in Southern Baptist work and that a transfer to Southwestern Seminary was in order. I finished that semester at Dallas and headed over to Southwestern. At times, I have had promptings and leadings that I knew were from God. How did I know? It is hard to say for sure. There is no question that the doctrine of the subjective leading of the Holy Spirit has been badly abused in the modern church. I would guess that every reader can call to memory an encounter with someone who claimed God was telling them to do something that you knew they shouldn’t be doing. I had a friend who had a new girlfriend. He came to my house bubbly one day, because God had told him that he and Sheila (not her real name) were supposed to be together. A few days later, he told me that God had spoken to him that he and Sheila were not right for each other. Strangely, every few days over the next few weeks, God seemed to change his mind. Yes.No. Yes. No. The leading of God changed often. We all know what was happening here. My friend was being led by his conflicting emotions and calling them the leadings of God. This concept is badly abused; I will not deny that. But the abuses of a doctrine do not negate the doctrine itself. If some abuse the liberty we have in Christ, it does not negate the fact that we have liberty. If hyper-Calvinists abound, that does not change the fact that God’s sovereign grace is our only hope of salvation. And if people abuse the idea of the subjective voice of God, that does not change the fact that from Genesis to Revelation, God spoke to his people and revealed personal, specific and detailed plans for their lives. How do you know when it is the voice of God? I cannot give you and hard and fast rules, but there are some principles we can follow. First, be in the Word of God regularly and diligently.The Bible is God’s Word – its pages are the voice of God to our hearts. The more you are in the Word, the more likely you are to hear God’s voice clearly and to identify those voices that try to imitate the divine voice to lead you astray. There is no one in more spiritual danger than the person who claims to hear the voice of God while the Bible is a closed book in his life. He is likely to be led astray and deceived. The spiritual predators in this wicked world will find him easy game. An active Bible study and prayer life is crucial to finding the personal plan of God for your life. It is also crucial to note that when God spoke to Paul, he was on the move, actively obeying the commands that he had received from God. He was not sitting on the shore of the Mediterranean sipping lemonade with his feet up waiting on God’s direction. He had the command of God to be a testimony of Christ’s grace to the ends of the world, and he was obeying it. As he was on the road, God led and directed him. God does not speak his clear voice to the disobedient and lazy. He guides those who are following his revealed purposes and plans. Do not expect to hear the voice of God clearly if you are walking in disobedience, rebellion or for selfish purposes. The only voice you might hear there is the call to repentance. It is also a good idea to listen to the wisdom of the body of Christ. Ultimately, you must obey God whether anyone else agrees or not. Paul was warned repeatedly by church leaders and even a prophet not to go to Jerusalem. He went anyway, believing that was God’s plan for him.But we must also listen to the wisdom of the Body of Christ. If you feel called to a teaching and preaching ministry, yet when you are speaking, people stay away like you have H1N1, you might not be hearing God correctly. The Body of Christ does not command you, Christ does. But only a fool refuses to listen to its wisdom and testimony. Spirit-filled believers can be a great help in finding God’s plan for your life. The simple fact is that when I hear my wife’s voice on the phone, she does not have to identify herself. A simple “hello” is enough for me to know who she it. I have heard her voice frequently (no joke intended) since I met her at a Halloween party in 1975. I know that voice.The more I walk in the Spirit, the more I immerse myself in the Word, the more obedient I am to Christ, the easier I will find it to identify the Voice of God and recognize the whisperings of imposters. Proverbs 3:5-6 gives us a template for this process. “Trust in the Lord with all your heart, and do not lean on your own understanding. In all your ways acknowledge him, and he will make straight your paths.” My job is to trust God, not my own wisdom. I am to submit to his purposes and follow his plans for my life. I must acknowledge his right as Lord over me in all things. When I do this, I have the promise of God that he will direct me; that he will straighten the path before me and make my way plain and sure. It is the master’s job to direct the obedient servant. It is the servant’s job to obey the master. If I do my job and live in obedience and submission the will of God, I can be assured that God will do his job and faithfully guide me on the path he has set for me. I may not receive a detailed itinerary of the rest of my life. It seldom works like that. It is often more like walking hand-in-hand with him, step-by-step through life. When God makes his will plain, I obey. As I take that step of faith, God reveals the next step. Day-by-day I walk with him on the path to glory. I believe that is the way God works. He guides us day-by-day as we walk step-by-step hand-in-hand with our Father. That is an exciting way to live, and adventure of faith. Walking by faith is never as easy as walking by sight, but it is the path to the power of God and significant service in the name of Christ. God loves me and he has a wonderful plan for my life. It may be a plan that involves pain and suffering. It may not be an easy road that God has called me to walk. But if I trust in him and acknowledge his rights over me, I know he will lead, guide and direct me to my own Macedonian ministry, to a place of significant service to him in which my life, under his hand of power, will make a difference in this world. My redeemed friend, I know he will do the same for you! I am pastor of Southern Hills Baptist Church in Sioux City, Iowa.